Take a large mixing bowl add in the white flour, brown flour, baking powder, bicarbonate of soda, salt and sugar. Add the butter. Mix the butter well to form a bread like consistence. Stir in the milk and yogurt. Add in the water and mix the mixture until it forms into a soft dough. Additional flour maybe needed if the dough appears sticky. Roll out the dough into 0.70cm thick oval shaped disc shapes. In a pan combine the butter and allow it to melt. Stir in the garlic and freshly chopped coriander. Remove the butter mixture from the stove top. Place each oval shaped disc on a hot griddle pan and toast. 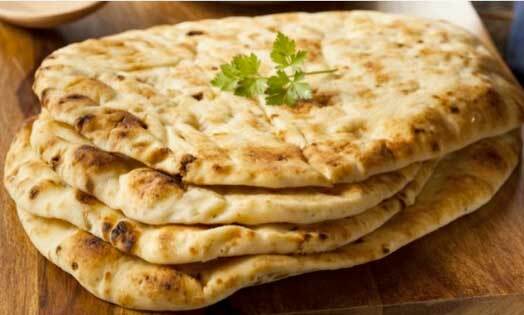 Apply the butter mixture on the surface of each side of the naan bread during the toasting process. Serve the naan bread hot.